Also known as the Hridaya Yoga Retreat: Module 1 Intensive, this is a holistic course that creates the conditions for the revelation of our Real Nature, the Spiritual Heart. It is a life-changing journey in which fundamental spiritual topics are introduced in both a practical and theoretical way. This retreat is a highly beneficial and transformative program that can bring amazing purifications at the physical, psychological, and mental levels. You will learn how to awaken and become aware of subtle energies, the chakra system, and kundalini, which facilitates a profound psycho-mental regeneration. Hridaya Yoga provides two comfortable six-bed dormitories and spacious private rooms with eco-friendly bathrooms. Guests enjoy the use of a refrigerator, access to clean drinking water, and two vegan meals per day. You may choose to reserve a private room for yourself, or you can choose the shared option to be placed with a roommate. As accommodation at the Hridaya Yoga Center is limited, you are welcome to join this retreat without purchasing the lodging package. If you need assistance in finding alternative accommodation in the event they are fully booked or you would like to stay on after your course ends, Hridaya Yoga Center will be happy to support you in finding financially accessible options in the nearby towns of San Agustinillo and Mazunte. This course features 3 classes per day for 19 days (Sundays are days off). There are 2-hour morning and afternoon sessions that include yogic theory, Hatha Yoga practice (asana and pranayama), and short meditations. Evening lectures present a variety of important topics in yogic philosophy and lifestyle, all taught from a Hridaya Yoga perspective. Additionally, you may participate in one-hour daily Hridaya morning meditations. This Hridaya Yoga intensive yoga course aims, through its vision, methods, and attitudes, to make these teachings resonate more deeply within each of us. They are rooted in the consciousness of oneness, and our highest priority is to keep the universality of the message, beyond dogma and biases. The teachings unfold over four weeks: week 1 (introduction on subtle structures), week 2 (purifications), week 3 (spiritual transformations and grace), and week 4 (integration in daily life). You will receive a course booklet that provides valuable information regarding the theory introduced in the Hatha yoga classes. Supplementary materials for evening lectures are available in a separate booklet. The practice of Hatha yoga provides an intimate inner knowledge of the physical body, of its bio-energies, chakras (energy centers), and of our ultimate nature. Therefore, a contemplative attitude and an awareness of what we essentially are is an important part of the practice. It teaches us how to open to the limitlessness of energy. What we consider to be just our energies are revealed as being universal. It opens our hearts deeply, bringing the perspective of Advaita Vedanta, the vision of non-duality. Hridaya Hatha yoga creates the condition for a deep relaxation and for opening to realize the transfiguration of the body itself. All of Hridaya's courses are lead by teachers who have completed the intensive 500-hour Hridaya Teacher Training Course. 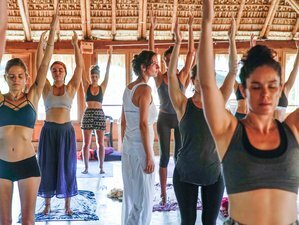 Hridaya Yoga is located in the charming and breathtaking little beach town of Mazunte, on the Pacific coast of the state of Oaxaca in Southern Mexico. Mazunte is a small, friendly village on the Oaxacan coast. The Hridaya Yoga Center sits atop an attractive hill with a breathtaking view of the Pacific Ocean. TThe three yoga halls and our sustainably-built accommodations offer an atmosphere of serenity and simple luxury. There is an option to book two vegan meals per day made and served with love in the Hridaya Yoga dining room. The meals are delicious, simple, and vegan. The dining room cannot accommodate food allergies and other special requests. If you generally are a very selective eater with many special preferences, you may prefer to join the retreat without adding the meal plan. No meal refunds will be given once the retreat begins. Meals are not served on Sundays as the kitchen will be closed. Please book your flight to arrive at Puerto Escondido International Airport (PXM) or Bahias de Huatulco International Airport (HUX). When you arrive in Mazunte, walk along the main street with the ocean on your right. You will pass the Turtle Center, and soon after the road will begin to climb. The center is located at the peak of the hill. If you start going downhill again, you have gone too far. From Mexico City, you have to go to one of these two bus stations, Central del Sur Taxquea or TAPO. Look for the bus company ADO (Camiones ADO). There, you should ask for a ticket to go to Pochutla, Oaxaca (pronunciation would be: Wahaka). It costs around 750 MXN. Usually, it departs at 19:30 and it takes around 16 hours to get to Pochutla. Alternatively, if you are heading from Puerto Escondido International Airport (PXM), walk out of the airport to the road, cross the street, and take a collectivo (trucks with blue tarp roofing over back) which will cost you around 10 MXN or less to the town. From there, you can catch a bus from near the SuperChe supermarket (40 MXN). Ask the driver to drop you off at Las Cruces de San Antonio, the crossroads where the OXXO convenience store is located. From there, you can take a taxi or collectivo for 5 MXN to Mazunte or San Agustinillo. If you are heading from Oaxaca City to Pochutla, there are two options for this. Either take the first class tourist bus that takes a longer (eight to nine hours), but less windy route, or a regular minibus that is faster (six hours), but takes very curvy mountain roads (Dramamine recommended for those who suffer from motion sickness). To take the first class bus, go to the ADO Bus Station in Oaxaca to buy a ticket. There are several departures each day including one overnight bus and there are several mini-bus companies. You can search about it online or ask someone at your guesthouse in Oaxaca for a recommendation. Their departure times will vary seasonally so call ahead and check the schedule. There are several ways if you would like to take a taxi. Taxis are available at both airports. You can take a taxi from inside the airports directly to the Center, but this is the most expensive option and will probably be around 800 MXN. For the cheapest price, walk from the airport terminal to the main road and catch a taxi from there to the Center, it will cost approximately 350 to 450 MXN. Alternatively, if you are coming from Pochutla, you can to take a taxi (around 150 MXN) or a colectivo truck (10 MXN) to get to the Center. Tell the driver to drop you at "El Neem" or "el centro de yoga entre Mazunte y San Agustinillo." Hridaya Yoga offers daily meditation sessions, Hridaya Silent Meditation Retreats, month-long yoga courses, workshops, and annual teacher training courses. Please note that the tuition-only cost for this program is 375 USD. Retreat center - Einstein Dorm - Meals Included.